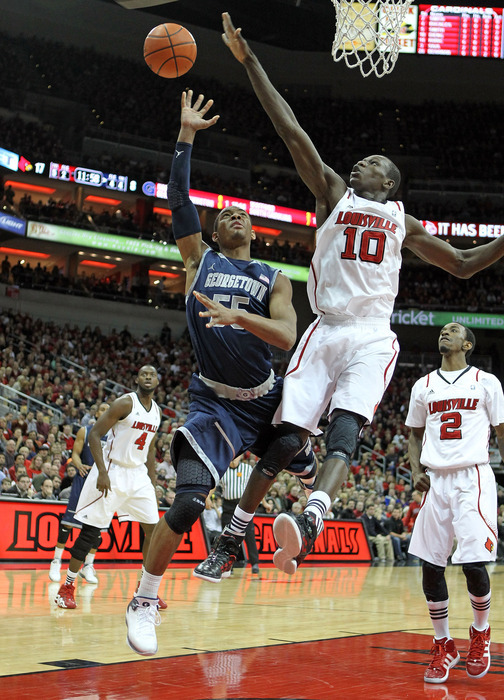 A year ago, Gorgui Deng’s game wasn’t polished enough to get him the same attention he’s recently been receiving. Nowadays, the 6’11” Big East Defensive Player of the Year is ditching his bad habits (starting with fast-food) and ironing out an attractive resume with hopes of being chosen as a lottery pick being the best passing big man in the draft (had more assists than both Peyton Siva, Trey Burke, and every other guard in the Tourney Championship Game), and arguably the best defensive one. We mentioned the BEDPOY honors, but Dieng’s also bringing a 7’3.5″ wingspan that helped him average 3.2 blocks per game. In a draft that’s offering four premier centers: including Steven Adams, Dieng, Kelly Olynyk, and Jeff Withey, Dieng is making a case for a spot at the top of the list. There’s no debating that Dieng’s most obvious strengths is his defense. He has the body and natural knack to defend the rim, his rebounding ability really brings out his mobility, and can not only defend inside, but outside on the perimeter. His great vision on offense allows him to be such a prolific passer, making him somewhat of a rare breed between the top shot blockers and assist men. On offense, he’s strong inside (improving his field goal percent from 59% last season to 66% this year), has developed a decent mid-range shooting game, and nice footwork with his back to the basket. At 23 years old, Dieng is the second oldest player in the draft which could pose a big question mark to teams on the fence. His body could benefit from more weight, and although we mentioned his good footwork, he shys away from creating for himself in one on one situations when his back is to the basket. Despite being a quick learner, he could get outplayed by smarter opponents at the next level, and with his current stature injury is a constant concern because of how thin he is. Dieng is by no means a “dream come true” center, but he could be the closest thing in this draft to a fantasy big man. He’s been projected anywhere from 12th to 23rd in mock drafts (In ours: 16th by Nate to the Celtics, 20th by myself to the Bulls), and there are plenty of teams that might be able to find a starting job for him. Pelicans? Kings? Timberwolves? Sixers? Celtics? Bulls? It’s undeniable that there are downsides to Dieng’s game, but one of those teams is going to give his offensive potential, defensive dominance, and great size a good home. This entry was posted in Home, NBA Draft and tagged 2013 NBA Draft, basketball, Boston Celtics, Chicago Bulls, Gorgui Dieng, Jeff Withey, Kelly Olynyk, louisville, Minnesota Timberwolves, NBA, NBA Rookie Class, NBA rookies, NCAA Championship Game, ncaa tournament, New Orleans Pelicans, peyton siva, Philadelphia 76ers, Sacramento Kings, sports, Steven Adams, Trey Burke by congetz. Bookmark the permalink.